“We regularly advertise with the About Thetford magazine which really helps us get our business out to local people. The distribution is fantastic and the communication I’ve always had with the team has been first rate. The flexibility given to us to change adverts means that we can adapt our advertising when necessary and I wouldn’t hesitate to recommend them for any other local businesses looking for excellent advertising”. 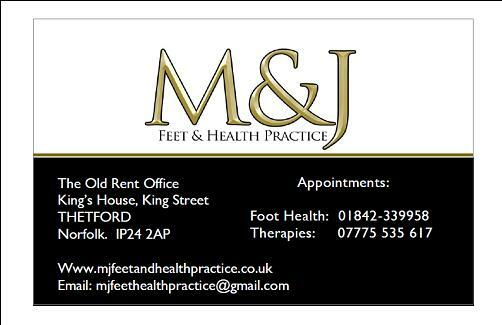 Our business M & J Feet & Health Practice is based in the centre of Thetford and serves our local community. The About Thetford Magazine has been an ideal place for our business to advertise as the magazine informs local people about the many services and products we offer. For our business it is our first choice when considering advertising, it is good value, offers a good service and above all is effective, all of which is essential when you are a small business. “Advertising with the About Thetford allows us to reach our core market, the people who matter to our business – the people of Thetford and surrounding villages”.